It breaks my heart every time I see a tree cut down in a town. This one was hollow to the core as I learned when I walked around it. But first I stood there for awhile – it was market day and I had bags full of winter greens and root vegetables that I was happy to put down – leaving me free to contemplate the body of the tree and the emotions that came and went. 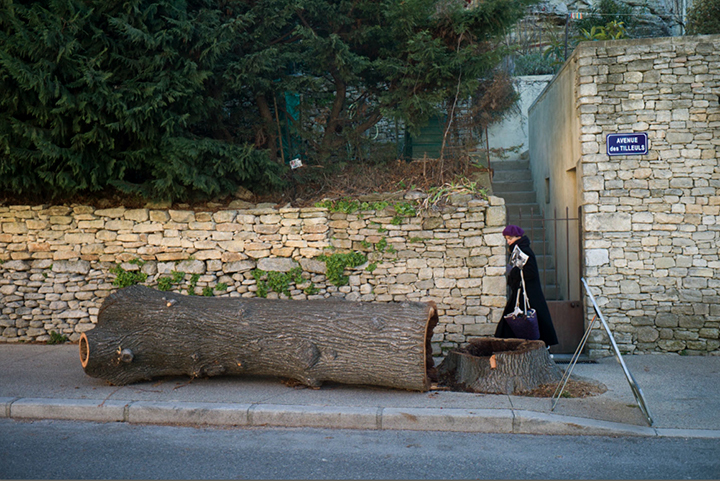 Then the woman in the beret walked by, and for some reason a figure entering the frame made me think that it would take about 8 people her size to equal to the mass of the trunk of that tree, that is if you stacked them up like cordwood. Not a pleasant thought but one that came to mind momentarily, as these things sometimes do..
Part of the pleasure of photographing is the amount of speculation that races along in my mind when I am out in the world. Carrying a camera is like having a license to see, and also to think about the unexpected ideas that rise up in relation to wherever I find myself. I have always said that photography – even though it is made of images – is really about ideas. Our ideas about who we are, what we feel, what things move each of us to raise the camera and acknowledge any given instant, as if it is only we who can see this. And it is! I feel that photography, even though the format is exactly the same for billions of people around the world, gives us a chance to say something about what we see in a truly individual way. We just have to figure out who we are so our identity comes through clearly. Photography can help to do that! 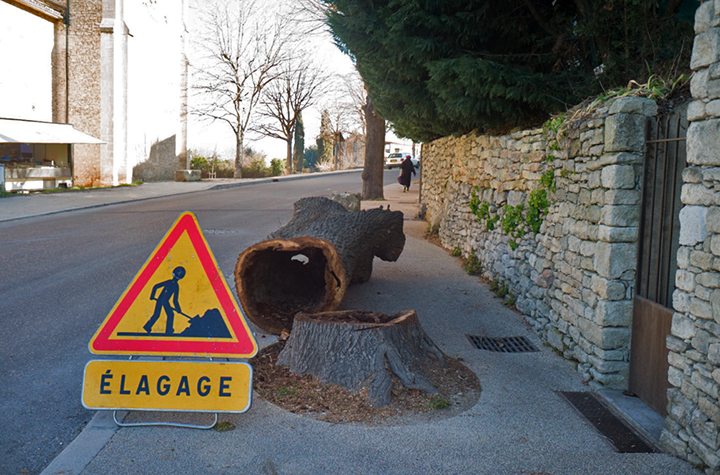 This entry was posted in Rainbow and tagged Bonnieux, France, Provence, street, Trees on February 27, 2015 by joelmeyerowitz2014. I see elagage means pruning. “Carrying a camera is like having a license to see,” Joel Meyerowitz.